Peel the eggs and mash roughly with a fork. Finely dice the parsley and onion and mix together. Add the parsley and onion to the egg and top with spices. Mix in well and serve for breakfast with a toast or pita bread. Delicious when eaten with fresh mint leaves and sipped tea. Hehe, I do love your post titles Fati 😀 Beautiful simple recipe – I can just imagine how wonderful it is as a breakfast! Eggs are so wonderful aren’t they? I always try and keep some ready boiled on hand, though the next time I make a fresh batch I’ll remember to whip up some of this too! I love the idea of mint with egg, haven’t tried it and still have some mint growing. Great idea. Like Charles I keep some hard boiled eggs in the fridge, so this would be quick, easy and super delicious to make! What a great idea to put mint and egg together. This would make a delicious crèpe filling! 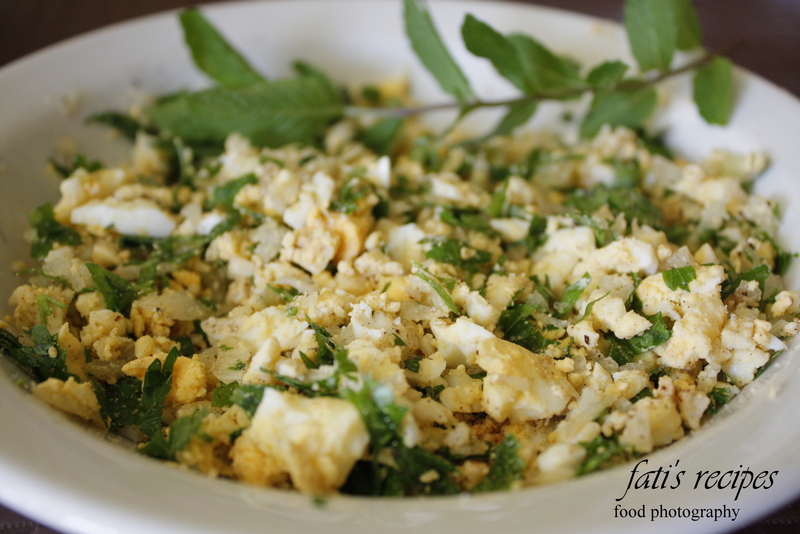 My family favourite breakfast dish, thanks Fati.